Do you want the quality of genuine Subaru parts at a reduced cost? Then you'll love remanufactured Subaru parts from Carr Subaru. How are remanufactured parts made? When a part fails or is worn out, experts fully disassemble the remaining core. They'll service what needs to be serviced and replace what needs to be replaced in order for the part to work again. Quality is ensured: at every part of the reassembly, the part is tested and held to the same high standards to which Subaru holds its new genuine parts. If a remanufactured part doesn't meet those same standards, it doesn't get sold. This means that the only real difference between a new part and a remanufactured part is the price (since it's more cost-effective to use an existing part core than it is to make one from all new materials). Come to Carr Subaru to see the various genuine Subaru remanufactured parts we offer! Carr Subaru, serving Portland and Tigard, is the place to go for all your Subaru needs. We have an amazing selection of new and remanufactured genuine Subaru parts in our parts store, as well as genuine Subaru chemicals and accessories. Our state-of-the-art service center is perfect for those who don't have the time or desire to install parts on their own. And of course, if you're looking for your next vehicle, you can look through our great selection of new Subaru vehicles, Subaru Certified Pre-Owned vehicles, and high-quality used vehicles. 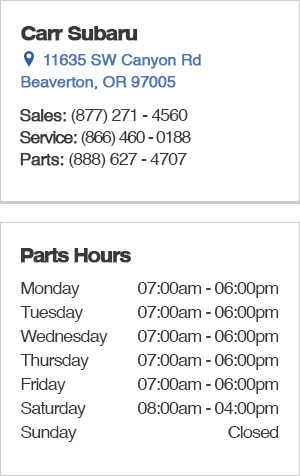 If you have questions or if you'd like to order parts, give us a call at (888) 627-4707; of course, you can always come browse our parts store in person at 11635 SW Canyon Rd, Beaverton, OR 97005. We hope to see you soon at Carr Subaru, serving Hillsboro and the entire Portland, OR metro area!